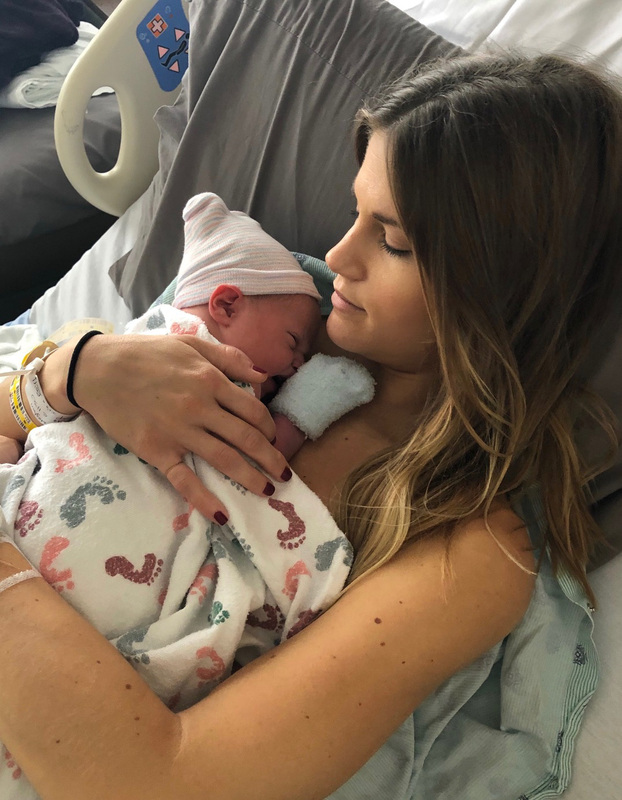 The first three months postpartum are referred to as the "Fourth Trimester" and it's an often overlooked time period for many women, but I wanted to share my experience and hopefully shed some light for my new-mom & mom-to-be friends. Greg and I agreed to limit visitors for the first week, and only allowed our parents to come to the hospital when Jack was born. We wanted to fully enjoy that time just the three of us as a family, without feeling the need to entertain while I was recovering and we were learning about our new reality. Looking back, I wouldn't have done this any other way. 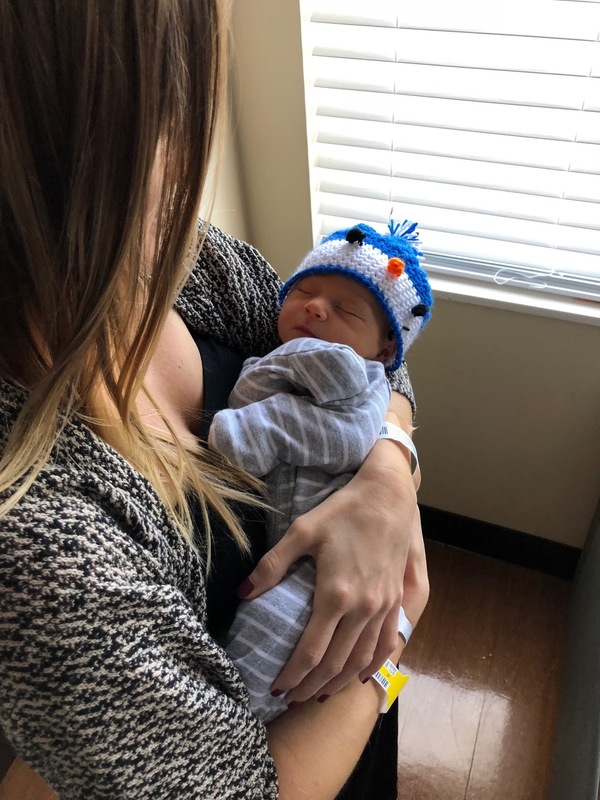 After about a week at home, we were ready to have friends and family come by to meet him, and it was so nice to have one-on-one time with each guest, rather than the chaos of the hospital with multiple interruptions every hour. 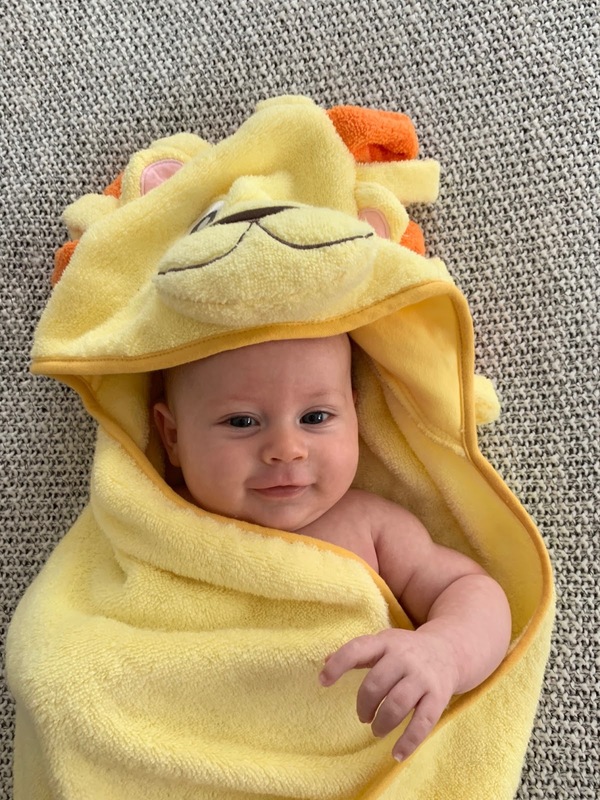 I was lucky enough to qualify for 12 weeks of maternity leave and decided to take the initial 8 weeks and then work part-time (3 days a week for 2.5 months) to drag out the last 4 weeks. This helped me transition well because leaving Jack is still so hard. My dad graciously offered to watch him two days a week so it’s a relief that family is taking good care of our boy. My parents’ condo is about 10 minutes from my office so I visit them on my lunch break to nurse him and get some mid-day snuggles. 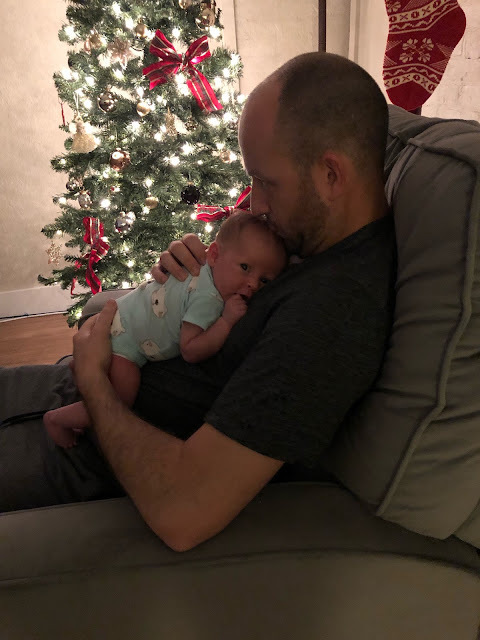 Greg qualified for 6 weeks of paternity leave and chose to take the first 4 weeks and save the last 2 in case of an emergency throughout the rest of the year. Having him home with me for the first month was the biggest blessing. We were both in a new parent fog of sleepless nights but it was so special to spend that time to really bond with Jack, and each other. Watching Greg become a father has made me fall in love with him all over again. He is so hands-on with our son ( bonus: he changes every nighttime diaper!) and is beyond supportive of me. Knowing that I have the best teammate in this parenting game is the greatest feeling. Recovery was so much harder than I thought it was going to be. 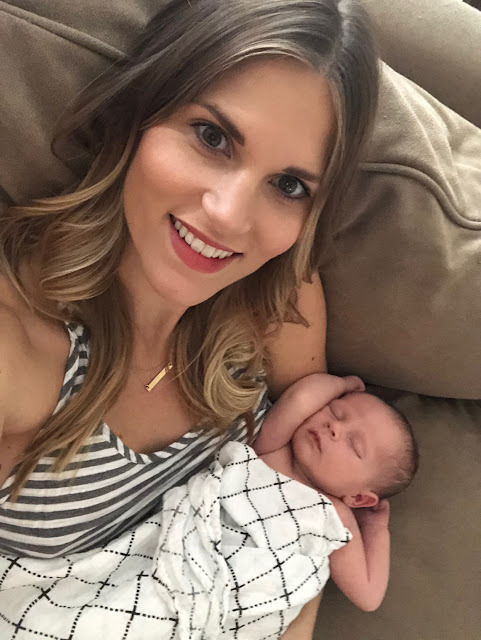 While I was pregnant, I created a kit full of postpartum care items but I was not prepared for how much pain I would be in. 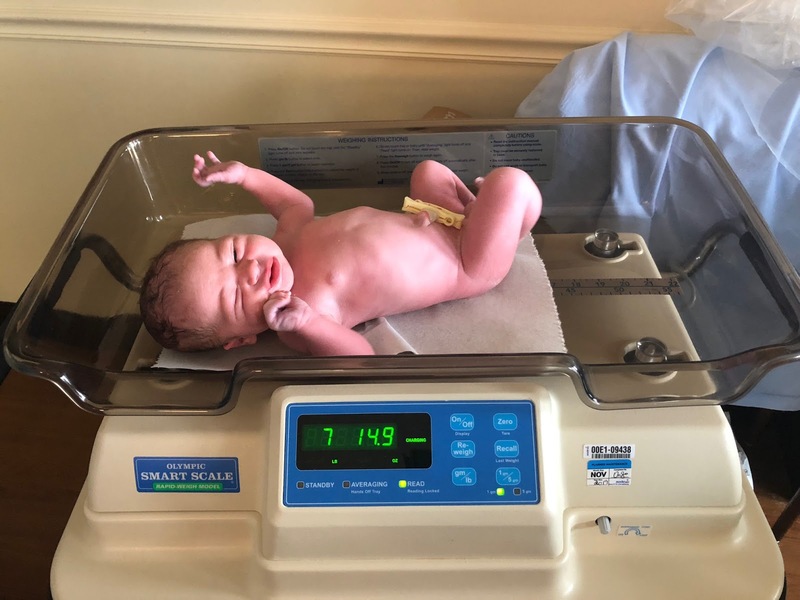 I had a healthy pregnancy and a relatively easy delivery (with a first-degree tear) but I felt like I had been hit my a semi truck for weeks! It wasn’t until a solid month postpartum that I started to feel “normal” again. 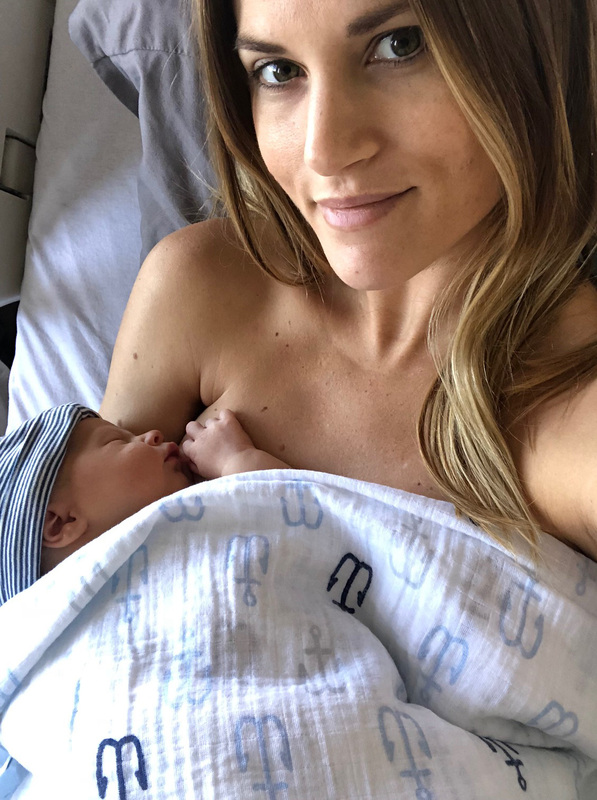 I feel like postpartum care isn't talked about as much as it should be. Between the obvious physical changes and challenges mixed with the hormonal roller coaster, it's a struggle. Thankfully I did not experience symptoms of postpartum depression but definitely had the “baby blues” for about two weeks. My best tip is to ask for help - no matter how big or small. Even the simplest task of Greg keeping my water bottle full was a life-saver. After getting the 6-week all-clear from my doctor, I began going for walks around the neighborhood with Jack in the stroller. Getting some light exercise and fresh air did wonders for my mental state. I'm now back in my regular workout routine with weight-lifting which feels great! It's difficult to fit it into my ever-changing schedule, but squeezing in 15-20 minutes here and there adds up. One thing that I researched and felt so strongly about during pregnancy was breastfeeding. My approach was to give it my best shot for the first couple weeks and not beat myself up if it didn’t work for us, for whatever reason. I’m so grateful that I’ve had a wonderful breastfeeding experience so far. 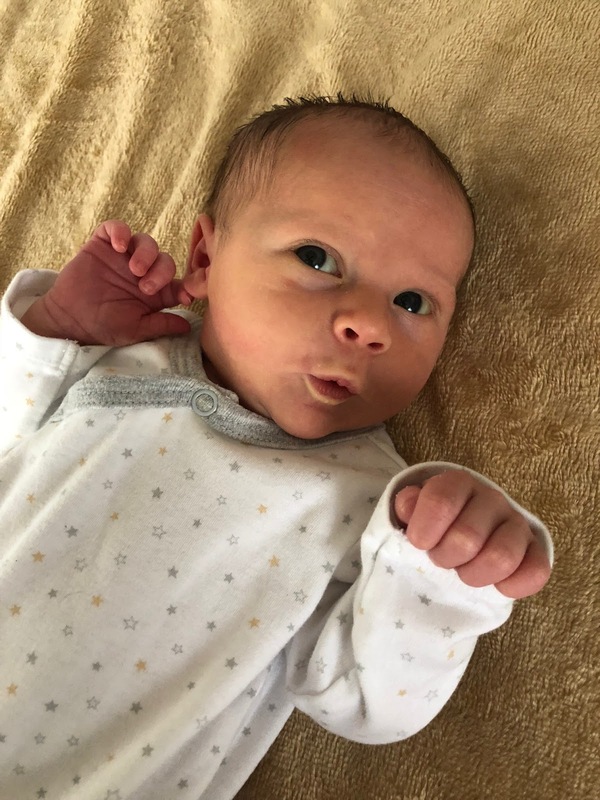 Jack latched on his first day of life and has been a great eater since (have you seen those cheeks?!) I enjoy it so much - the bond is indescribable. The middle of the night feedings are admittedly tougher but something about just the two of us being up together, snuggling and staring at each other is so special. There’s nothing I love more than the moment he’s full and he slides off with his eyes closed, and the look of complete satisfaction on his sweet face. I could watch him sleep in my arms for the rest of my life. Since I’ve returned to the office, I’ve had to pump which is a lot of work but I’ve gotten a routine down and it’s getting easier. We introduced the bottle when he was a month old, to ensure that my milk supply was established and that he was young enough to adapt. Jack doesn’t love the bottle while I’m at work but at least he’s being fed liquid gold. My goal is to exclusively breastfeed for at least the first 6 months. During my maternity leave I started a freezer stash, and it's comforting to know that we have a good reserve built up for those times when I’m unable to nurse. Sleep has been the hardest part - shocker! This kid resists naps, with 20-40 minute catnaps being his sweet spot during the day. The old adage “sleep when the baby sleeps” is impossible to follow. I’m a notoriously bad napper - unless it happens organically and I dose off on accident, I spend the whole time laying down with my eyes closed thinking of the million other things I should be doing (dishes, laundry, workout, shower). After tracking his habits on a baby app, we are slowly getting a nighttime routine established. He tends to go to sleep around 6-8pm for a 5-8 hour stretch, which gives Greg and I some time to make dinner and actually eat together rather than in shifts. After that first stretch, he only sleeps for 2-3 hours at a time before he’s ready to eat again, but it’s progress. are long but the years are short. The past three months have flown by and as much as I wish I could hit pause, I’m doing my best to truly treasure every day and stage. Watching Jack grow and his personality develop everyday is so rewarding. I am so lucky to be his mommy. 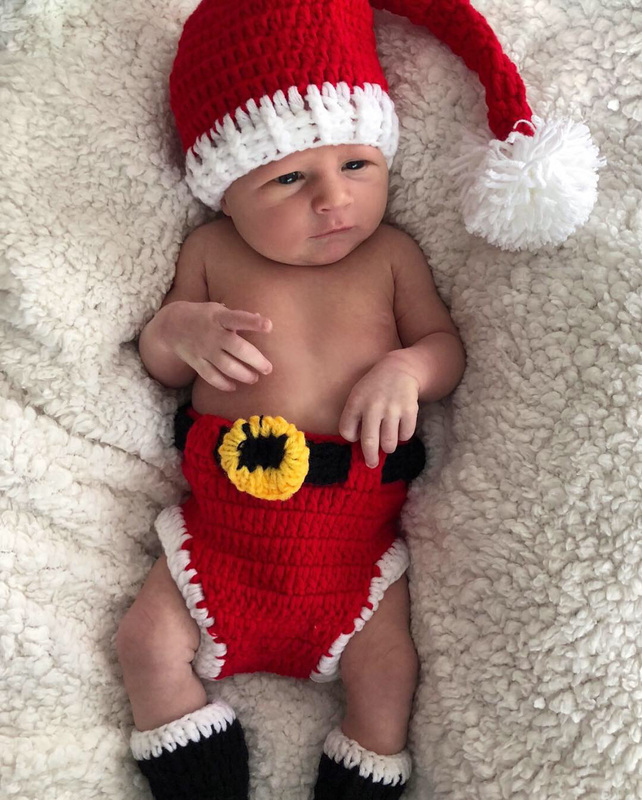 Our first Christmas morning as a family of three, eating cinnamon buns in our pajamas and staring at our little miracle. His scent, which smells like sweet milk. The sound of his coos and babbles. How he fits perfectly in my arm when he nurses, with his head in the crook of my elbow and my hand over his little tush. His gummy grin that lights up my life. That feeling when his body melts into mine as he falls asleep in my arms when we dance. 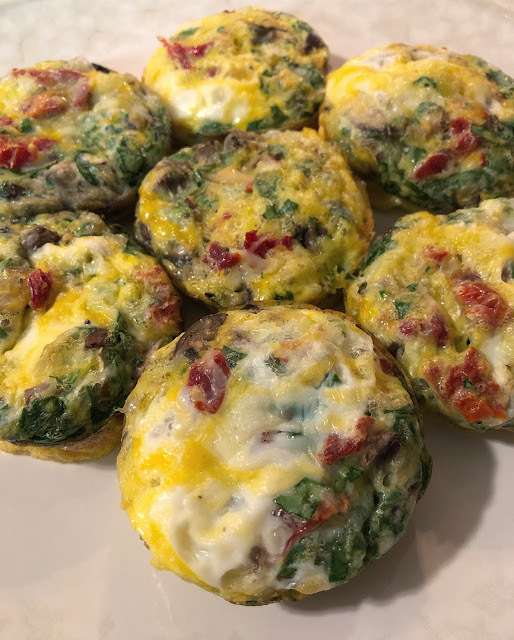 Looking for something quick & healthy that I can eat one-handed (life with a baby), I turned to these egg muffins. With endless options of toppings, they are the perfect protein-packed snack. I whipped up a batch using what I had in the fridge: spinach, sundried tomatoes & mushrooms, and sprinkled with a little cheese. The final result was easy and delicious. I plan to make a tray each Sunday so I can have a couple every day throughout the week when the breastfeeding hunger strikes! Preheat oven to 400 degrees. Grease or line muffin tins. Whisk together a dozen eggs and add salt & pepper. Throw in any toppings you want (meat, veggies, herbs, etc) and stir to combine. Pour mixture into muffin tins, filling about halfway. Sprinkle with cheese if desired. Bake for 12-15 minutes or until set. Cool on a wire rack and store in the fridge. When ready to eat, simply microwave for about 30 seconds and enjoy! Kicking off the New Year with a memorable craft project. I have teamed up with Basic Invite to create Jack's Birth Announcement, and absolutely love the way the final product turned out. There are so many different designs to choose from and I had a lot of fun playing around with the colors and font to make it unique. 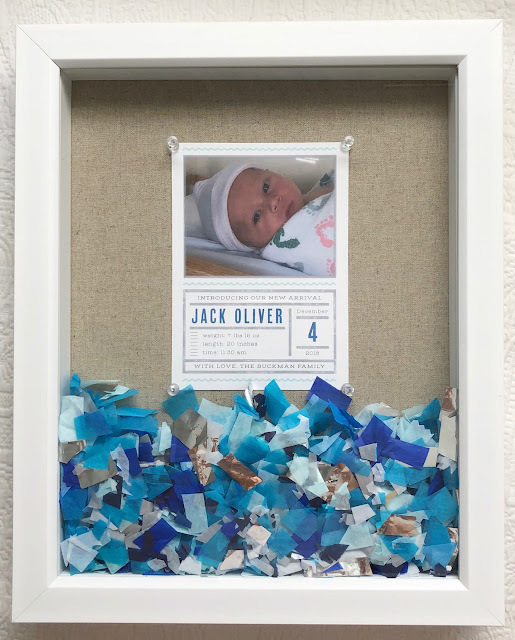 I saved some of the blue confetti from our gender reveal and made a personalized shadow box featuring his birth announcement with a photo from the hospital and all the details from his birthday, including the time he was born, his length and weight. It is such a special keepsake from the best day of my life, and is now hanging in the nursery so we can admire it for years to come. Basic Invite also offers Holiday Cards, Thank You Cards, Business Cards, Graduation Announcements, and all things Wedding - Save the Dates, Bridal Shower Invitations, and even Programs. 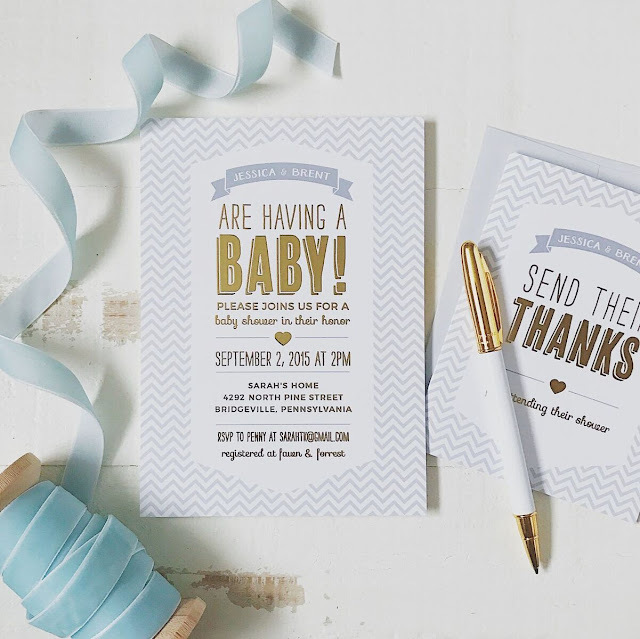 The templates on Basic Invite are completely customizable with over 180 color options to choose from and a variety of 40 different envelope options to really make your stationery stand out. 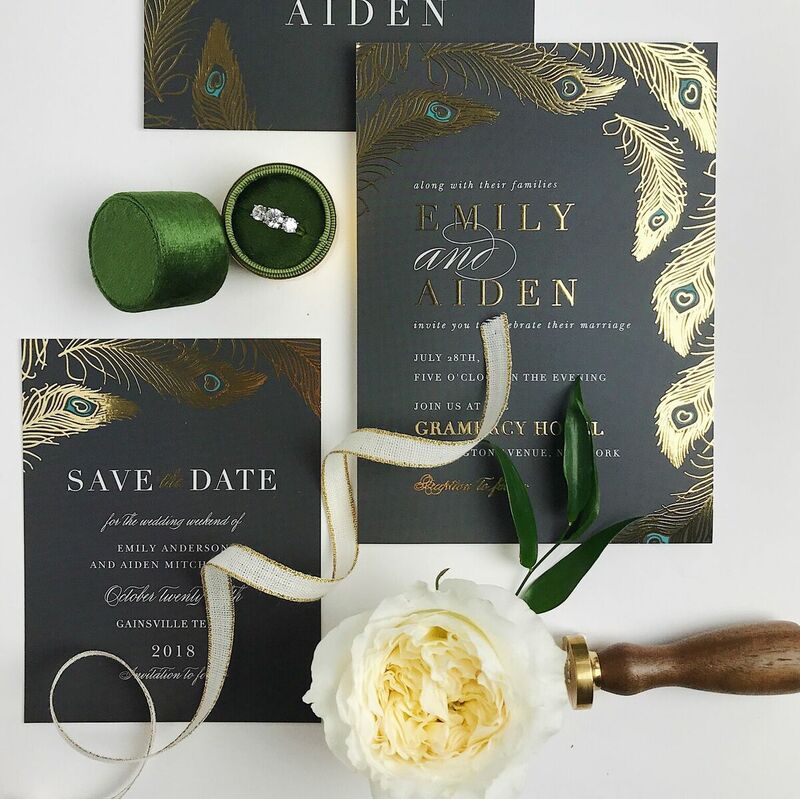 The foil accent applique is so cool - you can add flat or raised foil in gold, silver and rose gold to any design. 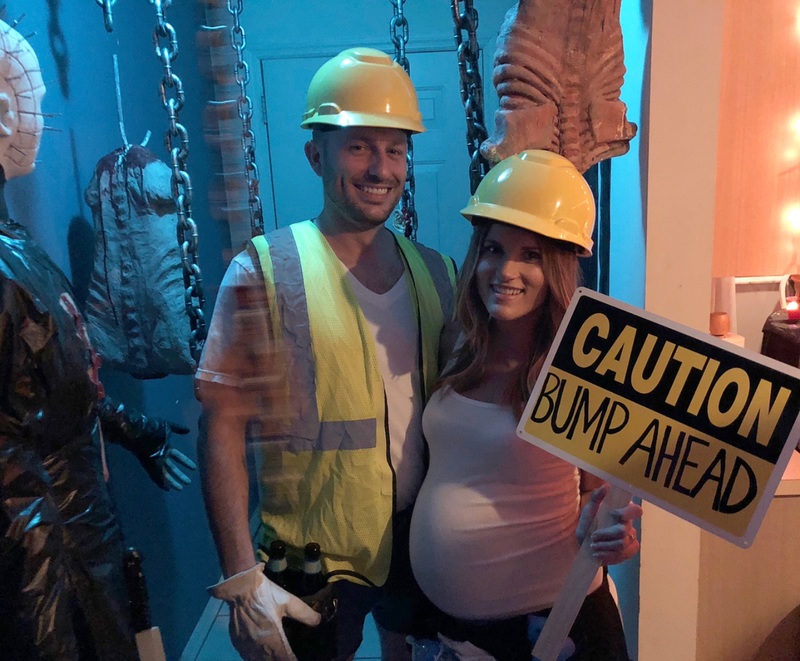 So many of my friends are expecting babies in 2019 (yay! 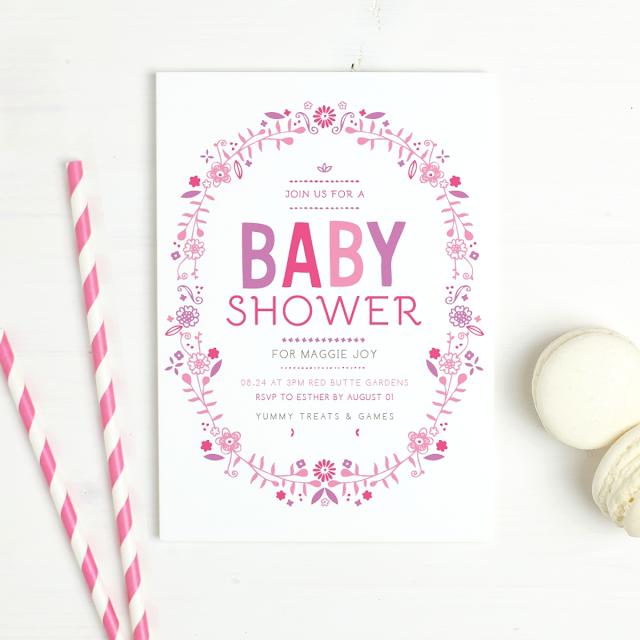 ), and Basic Invite is the perfect place to order Customized Baby Shower Invites. 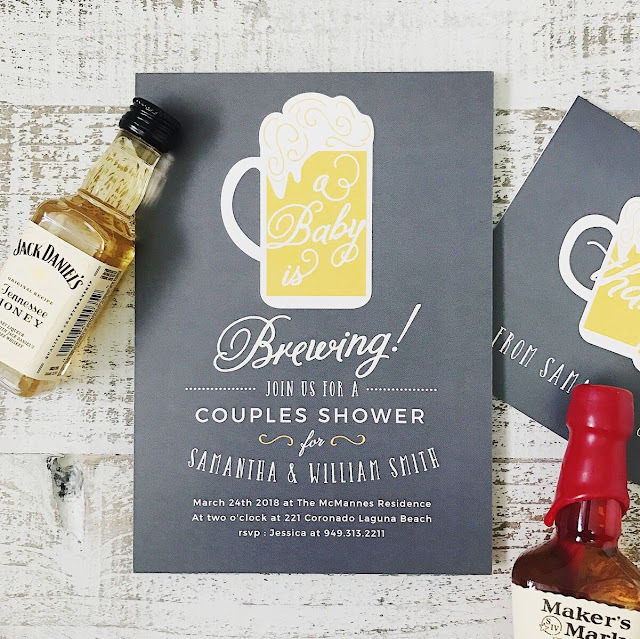 They have everything from Baby Boy Shower Invites and Baby Girl Shower Invites, and some of my favorite themed invitations: Western Baby Shower Invitations , Nautical, Safari and Backyard BBQ - check out the BaByQ Shower we had for Jack here. 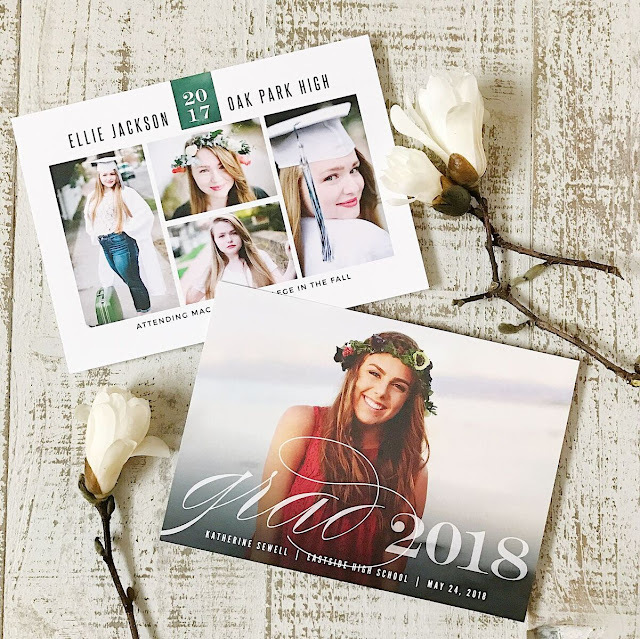 One of the best parts about Basic Invite is that you are able to request a sample before placing the order to see the quality of paper, photography and colors in person. Their address capturing service makes mailing out invitations a breeze by sharing a link on social media to obtain your family and friends' addresses, which then uploads to your account. With instant online previews and super fast shipping (5 business days! 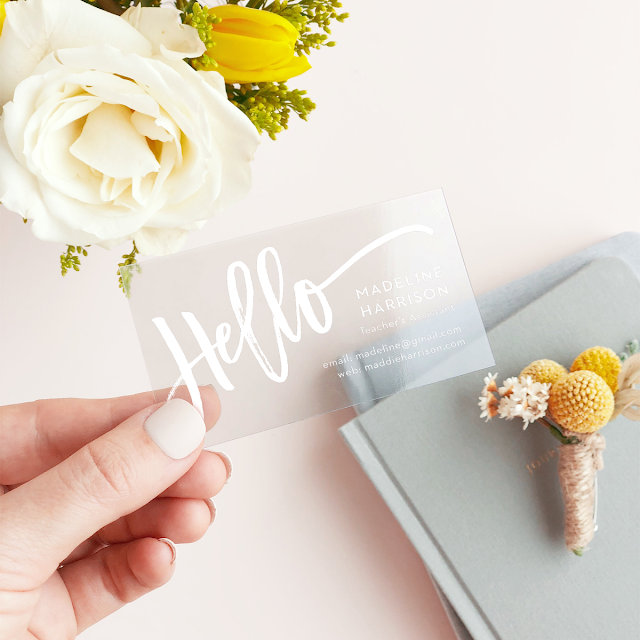 ), it's so quick and easy to create your own custom stationery. The past couple of years have been some of the most memorable of my life - getting engaged in 2016, married in 2017, and now becoming a mother this year! 2018 has been unforgettable and I’ve loved every chapter, from being pregnant for 10 months to welcoming our sweet baby boy, and career advancements being promoted to the Accessories Buyer at work. Sharing some of my favorite photos from this special year below. 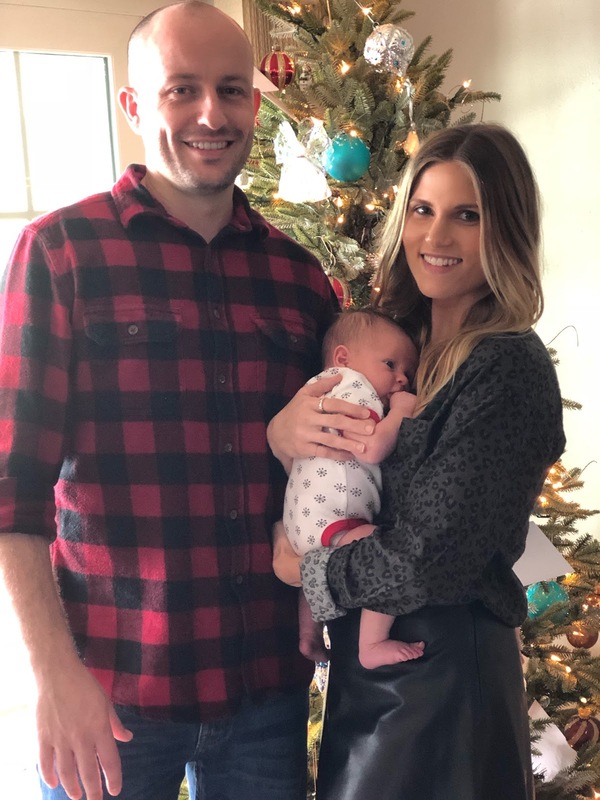 I can’t wait to see what 2019 holds for my new family of three. Wishing you all a fun & safe New Year! 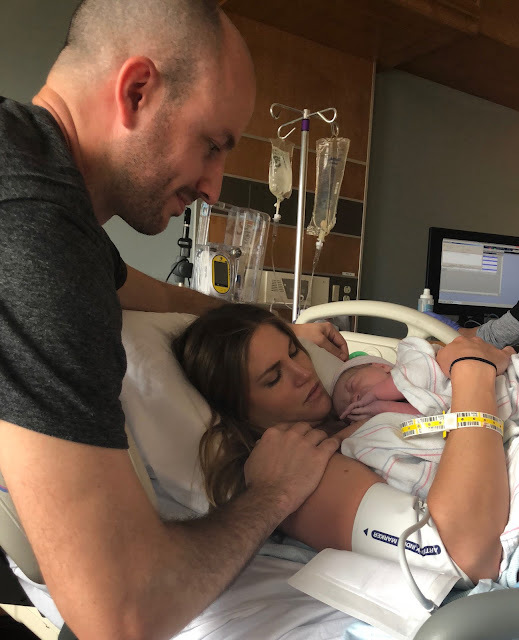 Jack Oliver Buckman made his grand entrance on December 4, 2018 at 11:30am, weighing 7 pounds 15 ounces and 20 inches long. About 6 years ago, while living in LA (and on a brief long-distance split with Greg), a friend asked me a question that changed my life. "What is something that you must do before you die that would make your life complete?" Kind of thrown off guard by such a serious question, I really thought about it and my answer was simple: be a mom. This conversation shaped my future, because in that moment I knew Greg would be the father of my child one day. I called him the following morning and we decided to give forever a shot. Two months later, Greg moved across the country and the rest is history. Two weeks ago my lifelong dream of becoming a mom became a reality when I gave birth to my son. 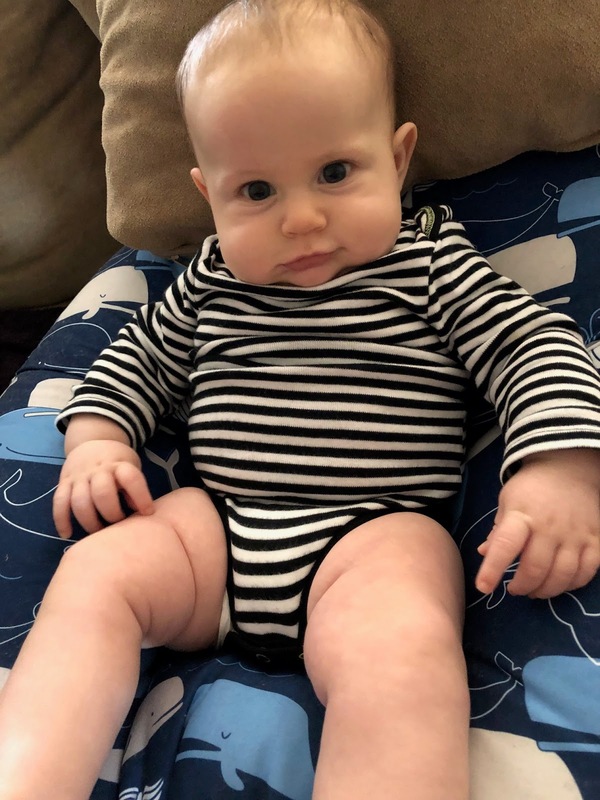 My due date was November 28th and my doctor advised an induction before reaching 41 weeks as the risk for c-section and other complications increases. I had an appointment to be induced on Monday, December 3rd. I had tried so many things to naturally speed up labor. 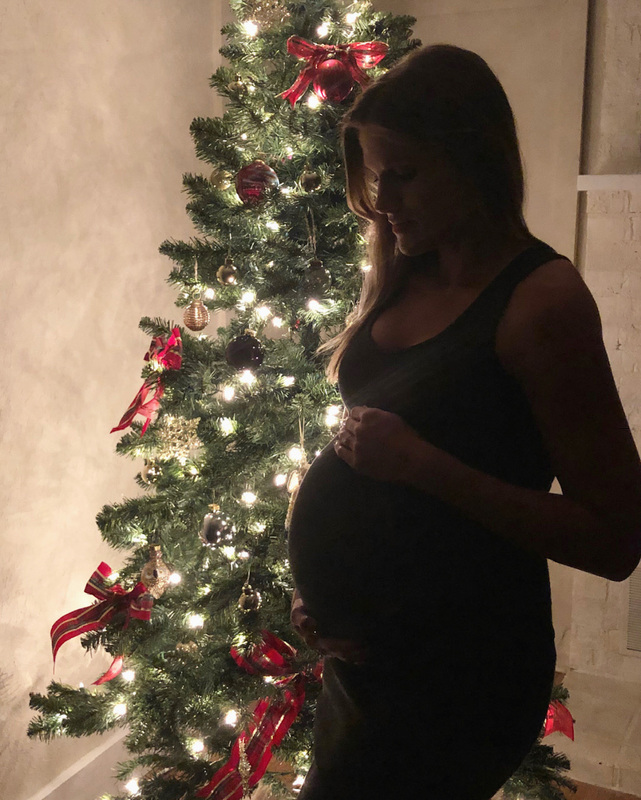 My body had started the process, with a few early labor symptoms and being dilated about 1-2 cm, but had been in that state for 2 weeks with no progression. I was so nervous about being induced and scared of the medication Pitocin commonly used. My anxiety was through the roof, crying constantly and not sleeping at all. My mom is a nurse and she talked to me about my fears, helping me work through my anxiety, and backed my doctors advice as well as my decision to go through with the induction. 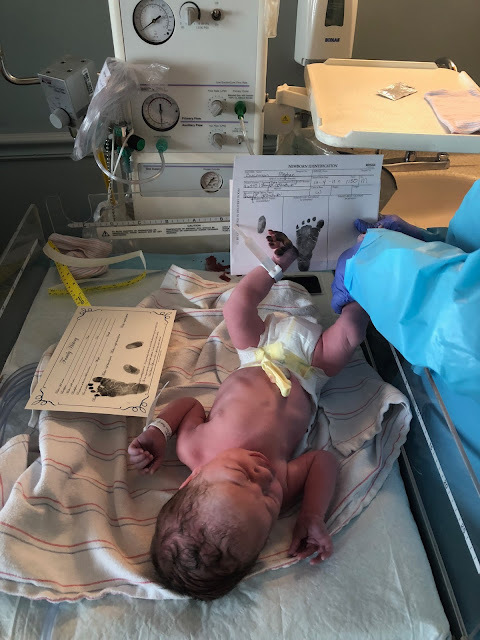 Greg, my mom (who was serving as my doula) and I showed up to the hospital at 6:45am on the day of my scheduled induction but we were unfortunately turned away as there were no open rooms available, and were told we would receive a call around lunch time to return. Slightly disappointed since I had mentally prepared for the appointment, we went home and waited for the call. I tried to keep my mind off everything - Greg and I took a long 45 minute walk around the neighborhood and I took a quick nap. I ate a hearty lunch and called the maternity ward back, and was told to come in at 1:30pm. Once I was admitted, it still took forever to get started as the floor was packed with patients. After a cervical exam showing I was still only 1-2 cm dilated, my doctor advised the nurse to give me Cervidil, which is typically a 12-hour process and then start Pitocin the next morning. Bummed that we were getting a late start at 6pm and would have to wait until the following morning to really get things going, but I was still trying to stay positive. 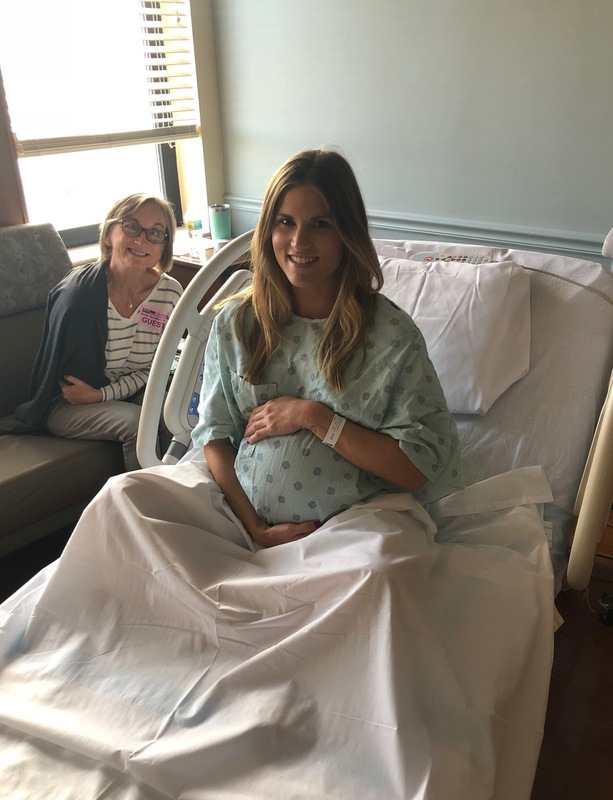 About a half hour after the nurse placed the Cervidil, she came back in to ask if I was feeling the contractions shown on the monitor. I wasn’t feeling much but encouraged that things were happening. My doctor came in to check me and moved the Cervidil even farther back (ouch!!) The contractions immediately started getting more intense accompanied with stabbing pain in my lower back. The nurse I had that night was so amazing - offering me heating packs for my back, brought in a birthing ball to bounce on, and hooked me up to a wireless monitor so I could walk the halls. Nothing was helping the pain and the contractions were on top of each other, never returning to the baseline. My nurse came back in to do another check after seeing the monitor and said we could remove the Cervidil since it kickstarted labor and my body was taking over. My doctor came in and broke my water at 1am. I called my mom shortly after to give her an update and she and my dad headed back to hospital to be by my side. The pain got so intense. I tried to just close my eyes and take deep breaths through each contraction but my body was shaking uncontrollably. My nurse said the anesthesiologist was down the hall with another patient and could give me an epidural whenever I was ready. At 3am I got an epidural, which was surprisingly painless. I started feeling better shortly after that as my lower body became numb. I slept through the active labor stage, with my nurse coming in every hour to shift me from side to side to help speed up the dilation process. By 5am, I was 6cm and at 7am I was at 9cm. It was almost go-time. Greg called his parents to start getting ready and head to the hospital since they live about an hour away. A little after 10am, my doctor instructed me to start pushing, with Greg and my mom by my side. Greg and one of the nurses held each of my legs for the next hour and 20 minutes until our baby was born. 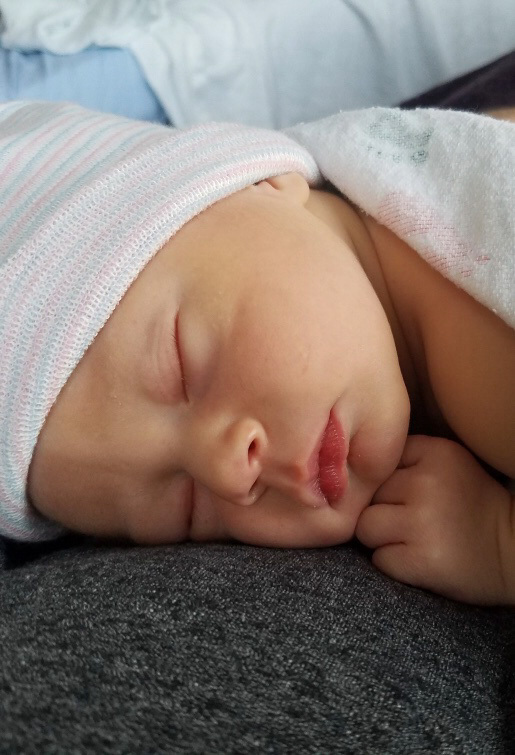 The epidural ran out at the worst possible time - he was crowning and I felt everything! It was extremely painful but the reward was beyond worth it. As soon as he was born, my doctor put Jack on my chest and Greg cut the umbilical cord shortly after. We snuggled skin to skin for a little while before taking his measurements. The doctor, nurses and my mom stepped out so Greg and I could have some time just the three of us. 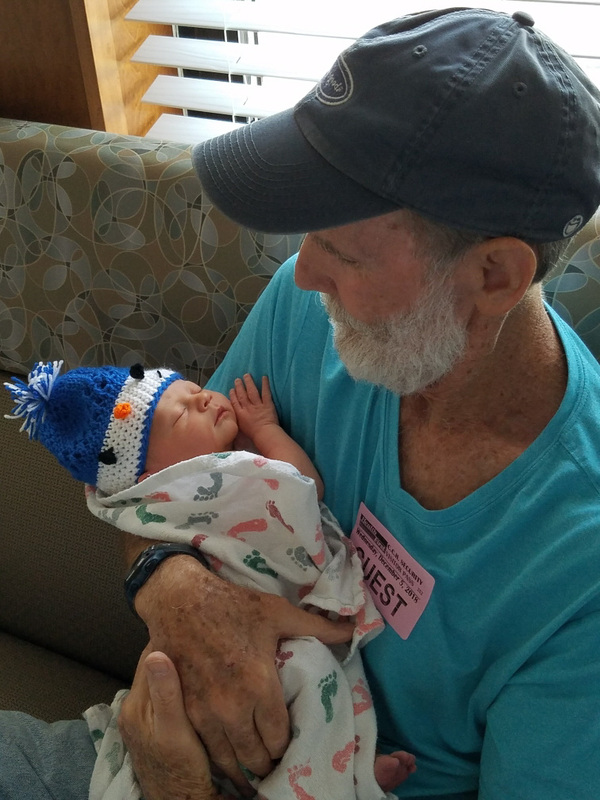 After about an hour, Greg went to the waiting room to get our parents to meet their new grand baby. Jack and I were alone for the first time. When I looked down at him, I lost it - tears of joy streaming down my face as the adrenaline of delivery started to subside and immense happiness flooded over me. I couldn’t believe I was holding my sweet baby boy in my arms. Many don't know that I was adopted, and it's something I rarely think about given that my parents and I have such a close relationship, and would never consider anyone else my Mom and Dad. But when Jack was born, I met my first blood-relative, which was a truly indescribable feeling. I can’t wait to see which of my features he received as he continues to grow and develop. 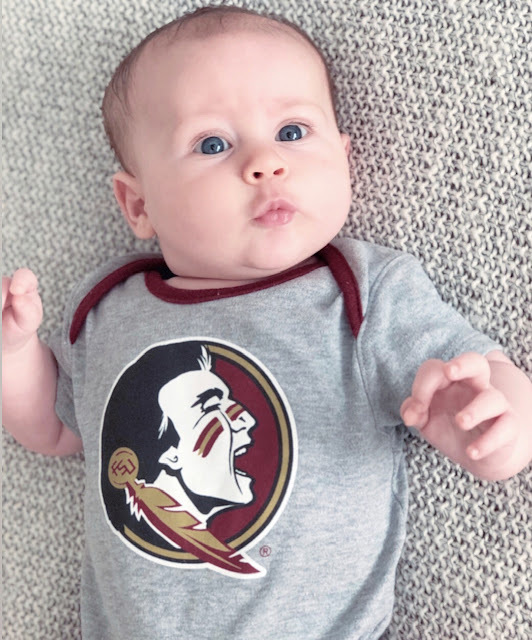 We have had our kids’ names picked out for years, and Jack was named after Greg’s grandfather. We had several contenders for a middle name but wanted to wait until we met our little guy to decide on one. 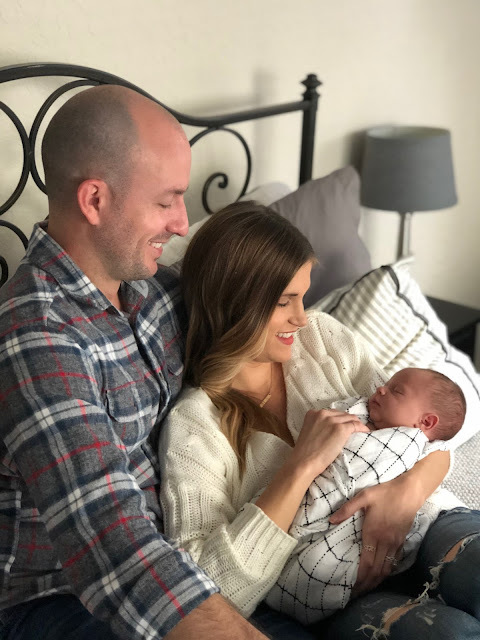 The night of his birthday, when the three of us had moved to the recovery room and finally had a moment of peace without interruptions, Greg and I discussed which middle name suited him best. We both immediately said Oliver. 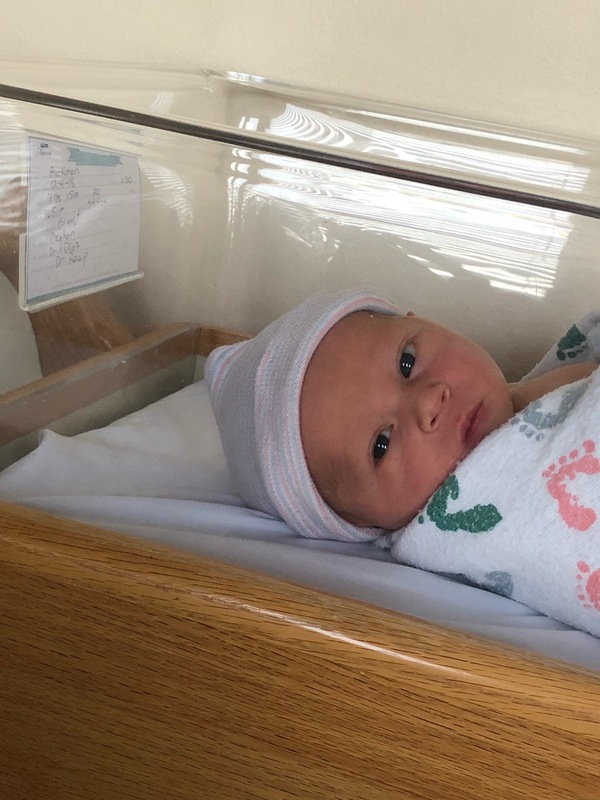 Overall the labor and delivery experience was almost exactly as I stated in my "wishful-thinking" birth plan. I’m so glad the induction went smoothly and my body naturally took over so I could avoid Pitocin. Greg and my mom were the best cheerleaders and so supportive throughout the process and I’m so glad they were with me. 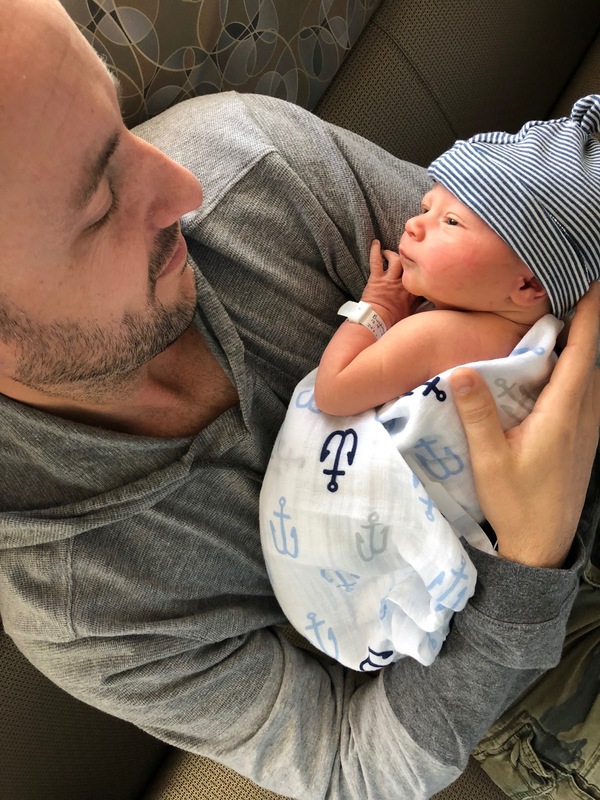 Greg and I feel incredibly blessed to have a healthy and happy baby boy. He’s so perfect and we fall more in love every day. I made it to the home stretch. I'm currently 38 weeks pregnant, and Jack could make his arrival any day. 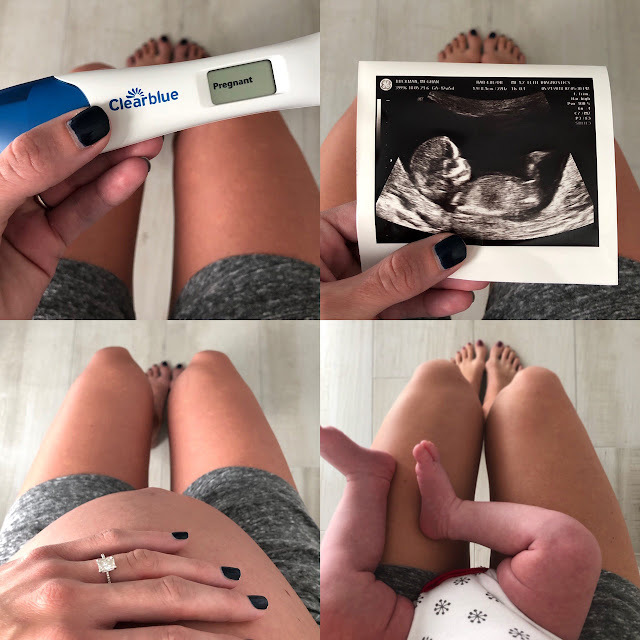 Pregnancy has been a truly unbelievable experience and I'm so thankful to have had a healthy journey. There have been tough days sprinkled in over the last 9 months but overall I've been happy, feeling pretty good and just beyond grateful for our little miracle. Greg and I have been together for 9 years and have always talked about wanting a family. 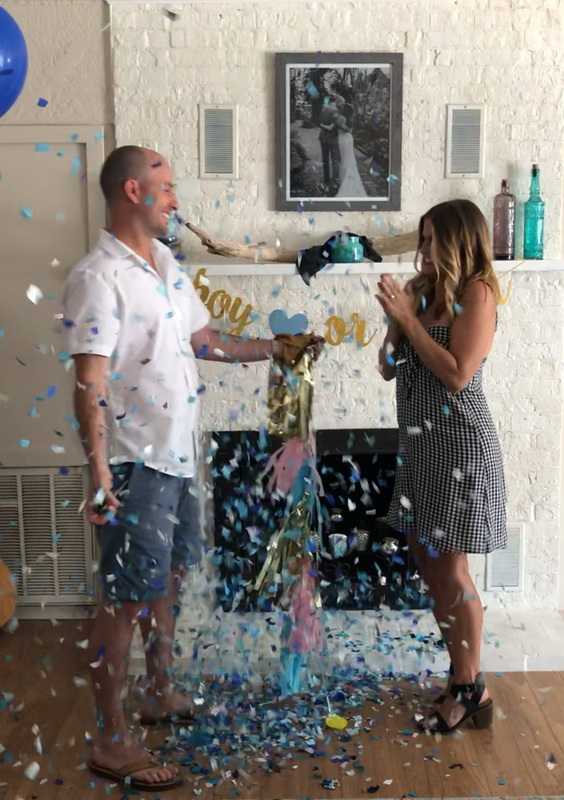 After we got married last year, we decided it was as good a time as any to start trying, and we feel really blessed that we will be meeting our son so soon. The aches and pains have definitely set in, but I've done my best to stay active during my entire pregnancy. Working out has become increasingly harder the farther along I've gotten, but I am still going for (almost) daily 30-45 minute beach walks, albeit at a much slower pace. 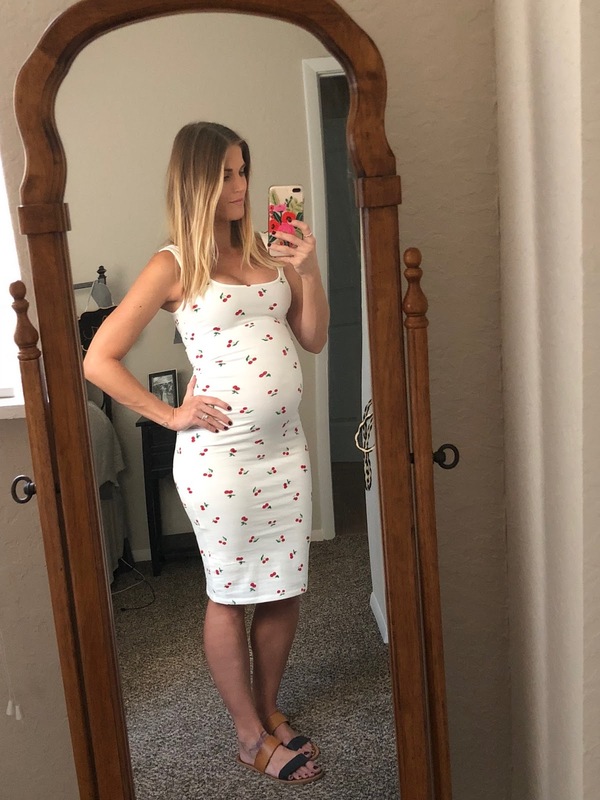 Late in the second trimester, I began experiencing some pain in my abdomen and pelvis so certain exercises only made it worse. 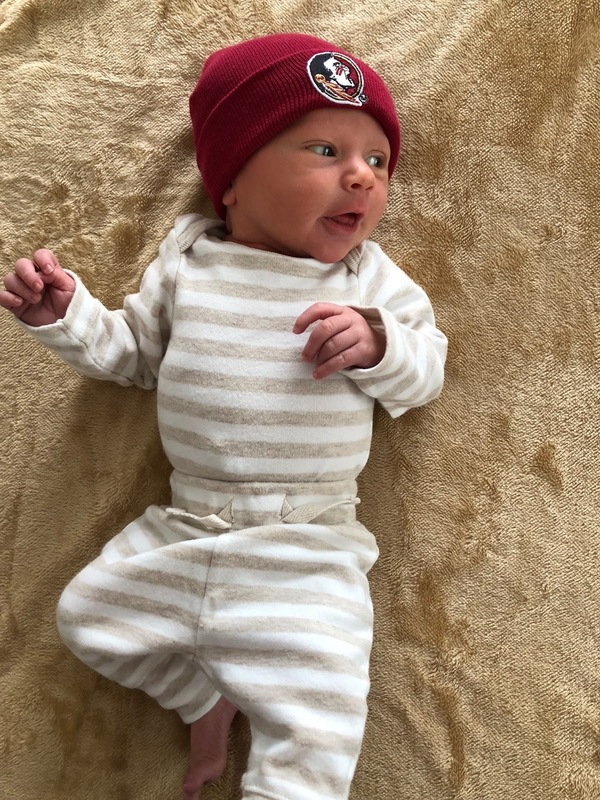 Between 34 and 36 weeks, he dropped and the pressure has been intense with random jolts of shooting pain that stop me in my tracks. I have had good days and bad days, but have taken advantage of when I'm feeling up to it to go for a walk, lift light weights, and practice yoga. The recommended weight gain for pregnancy is between 25-35 pounds. I have tried my best to stay on the low end of that spectrum, given my petite 5'2 frame. I weighed 112 lbs pre-pregnancy and have gained a total of 26 pounds. I'm not going to stress myself out over losing the weight right away. 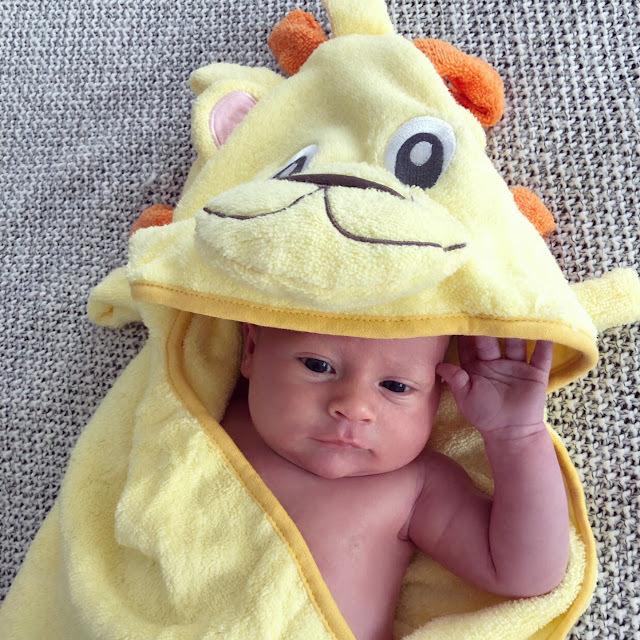 I'm focused on recovering and healing, and spending time bonding with my newborn. It took 9 months to gain the weight in order to grow my son, so I'm giving myself at least that much time to try and get my body back to "normal." It has been amazing to see my body transform and looking back at baby bump progression photos is mind-blowing! 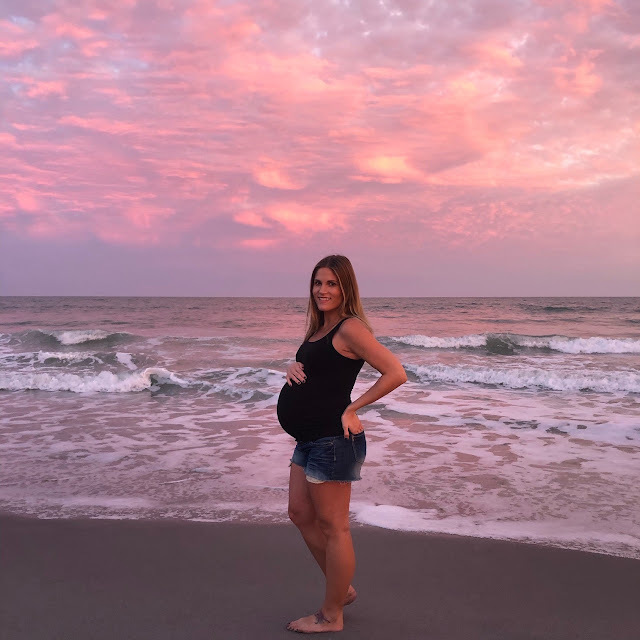 There are numerous physical changes with pregnancy, and a lot of them have to do with skin: acne, melasma, spider veins, the linea nigra, and stretch marks. Hormonal breakouts hit me hard during the first trimester, but have since settled down tremendously. I did not experience any melasma, which I contribute to wearing sunscreen on my face everyday, thanks to my SPF 30 tinted moisturizer. I also haven't seen any spider veins pop up. Around week 36, the linea nigra started showing on my belly, but it's very faint. Knowing that I'm prone to developing stretch marks (I have some from my teenage years), I've been super diligent about trying to avoid them. Starting at 9 weeks, I have applied Bio Oil and Burt's Bees Mama Bee Belly Butter twice a day. After every shower, I slather on Bio Oil while my skin is still a little damp, and every morning and night without fail, I have used the Burt's Bees lotion. Neither one leaves a residue on clothes, and neither one has a strong smell. I think using these products in combination with staying really hydrated (drinking a gallon of water a day, no joke) and gaining the recommended weight gradually, has helped a lot. I'm going to continue using both of these after delivery to help my skin stay moisturized while my tummy shrinks back down. I've been wearing comfy dresses 95% of the time (maxis and stretchy bodycon styles are the best!) 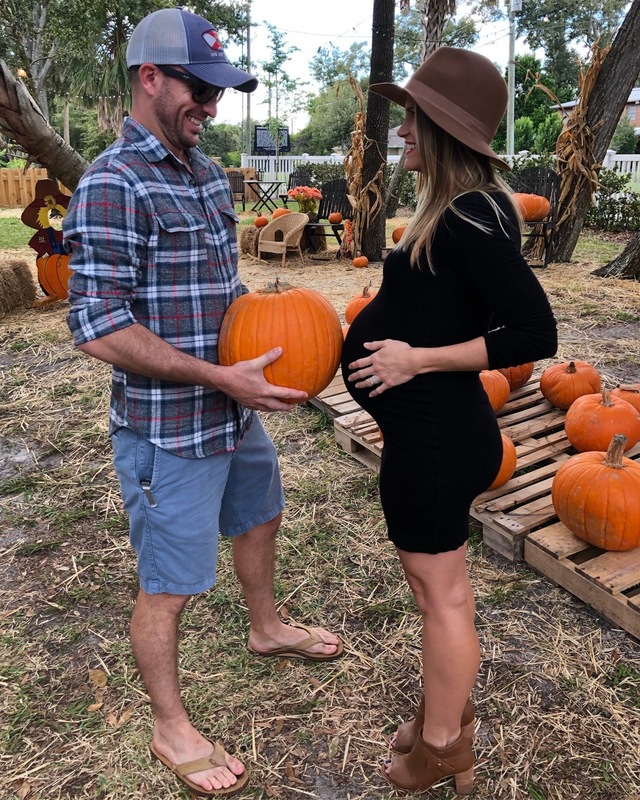 The only piece of maternity clothing I bought was one pair of jeans, but it's been such a hot year in Florida that I didn't wear them until the last week of October when "fall" finally decided to appear. The temperature dropped below 80 degrees and I decided I should at least wear them once before my bump is gone! I previously shared all the details of our Baby Shower - it was a fun day filled with family, friends, BBQ and playing in the pool. My amazing co-workers also threw me a surprise shower in October which was so special! Greg and I feel extremely fortunate to have a village of loved ones to help us in this new chapter. Everyone has been very generous and we have everything we could ever need or want for Jack! My parents have been crucial in preparing for our new arrival, and we're grateful that they live only 15 minutes away. 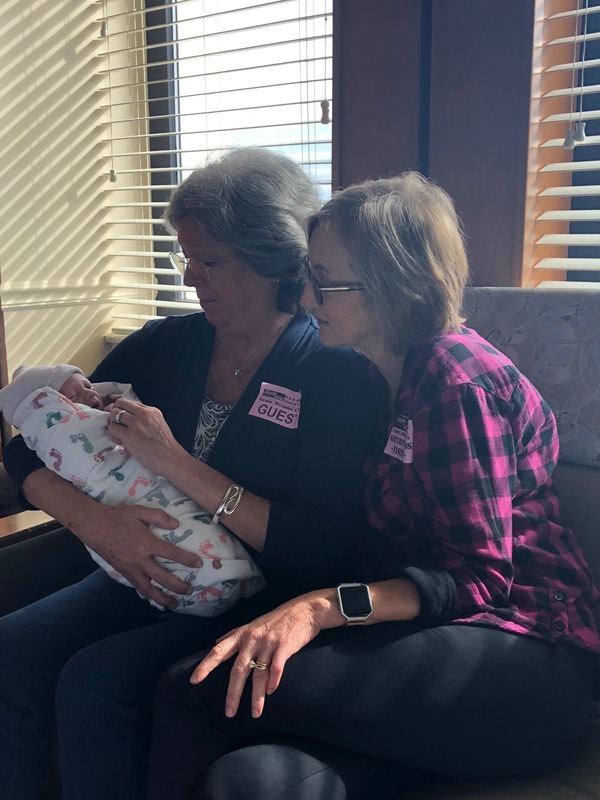 Nana and Poppy are over the moon about their new grand-baby! Decorating the nursery was one of my favorite parts of pregnancy, and I loved finding all the special pieces that tie the room together. It's surreal to think that we will be bringing our son home within the next couple weeks! Greg and I did a maternity shoot at the 8-month mark and I know we are going to treasure those photos forever. For the most part, I have enjoyed being pregnant and it's so nice to have documented memories to look back on, between pictures, blog posts and my own personal journal entries. It's no surprise to anyone that knows my husband, but Greg has been the absolute biggest support throughout this entire journey - everything from coming to doctor's appointments to cleaning the cat box, giving me back rubs and getting excited every time he feels Jack moving. On days when I'm in a lot of pain, he totally takes over - setting me up with a comfy spot on the couch, cooks dinner, cleans, everything! 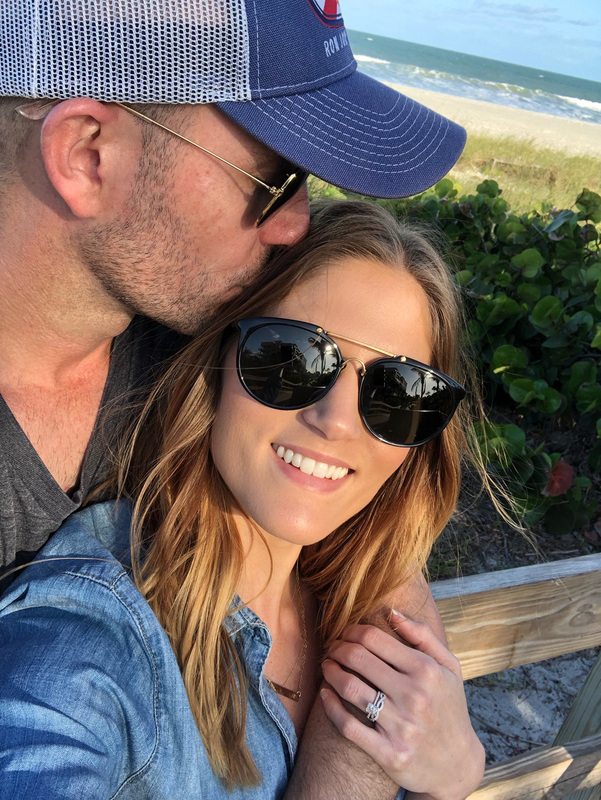 I already knew he was an amazing partner but he has gone above and beyond these last 9+ months. He is anxious to meet his mini-me, and I can't wait to see him grow into his role as a father. 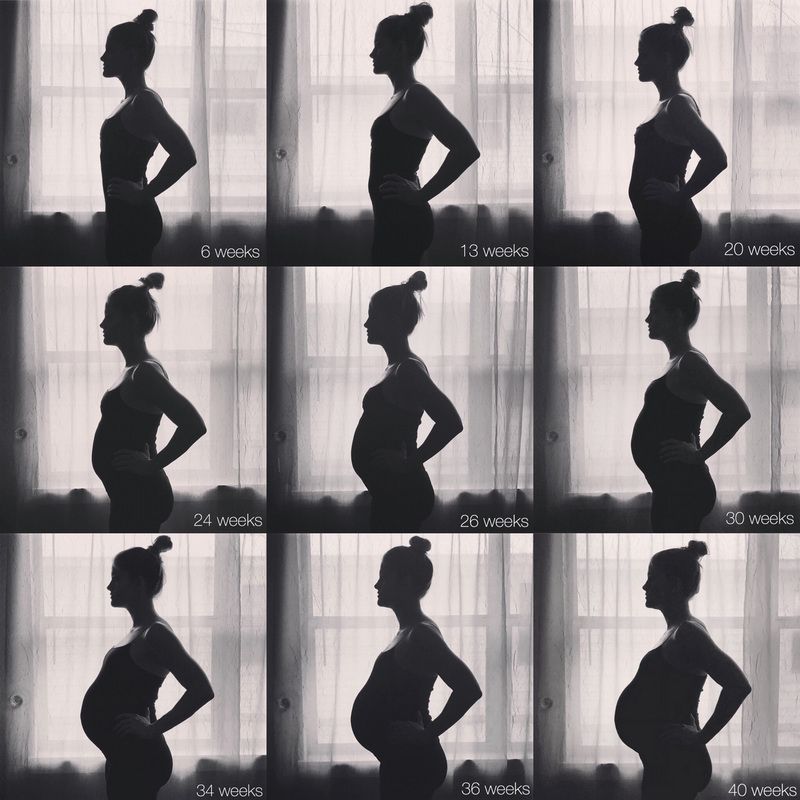 As I'm nearing the end of pregnancy, I have a lot of mixed feelings. I am thrilled by the thought of meeting our little man, but I'm going to miss having him with me every second of the day. I already feel so connected to him, knowing that my body made his, everything from his eyelashes to his toes. I have been his home and know he's safe in there - protected and getting all the nutrients and sleep he needs. The thing I'm going to miss the most is feeling Jack move in my tummy - I'm soaking up all the kicks, jabs, hiccups and rolls while I can. He's running out of room in there lately but every movement is the sweetest reminder that he will be in my arms soon. 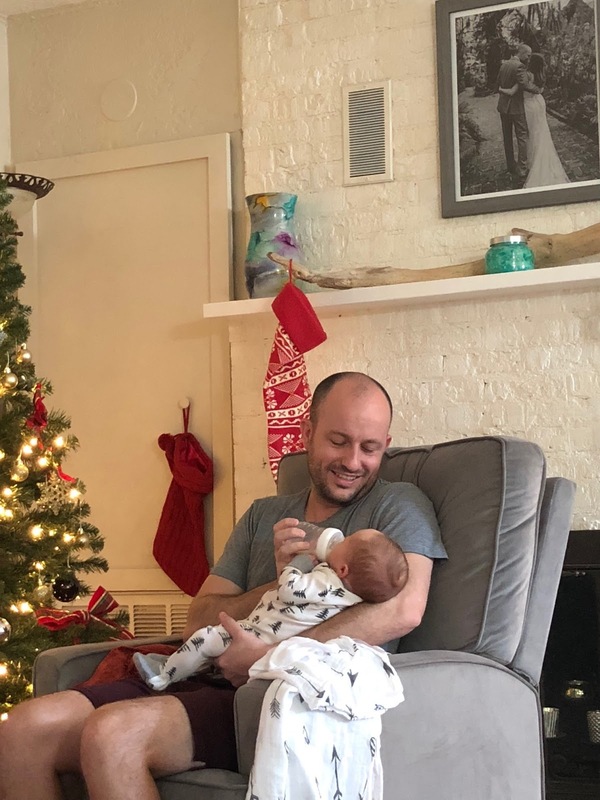 Greg is planning to take off work for the first four weeks after Jack arrives and I couldn't be more excited for the time we are going to spend as a family of three, enjoying all the new baby snuggles, learning about our little guy and being sleep-deprived together. Our hospital bags are packed and waiting by the door - the final countdown is on! Who doesn't want a bright, white smile? It's such a confidence-booster for me. 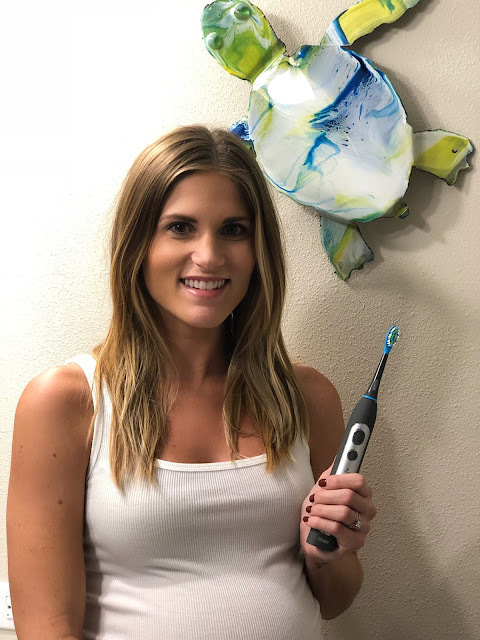 I worked with Smile Brilliant last year, and loved the whitening trays that kept my teeth sparkling for our wedding day, so I jumped at the chance to try out their new CariPRO Electric Toothbrush. As someone that has used a regular manual toothbrush forever, the CariPRO was a game changer. After using it twice a day for a week, I'm seeing and feeling a noticeable difference in how clean and white my teeth are. 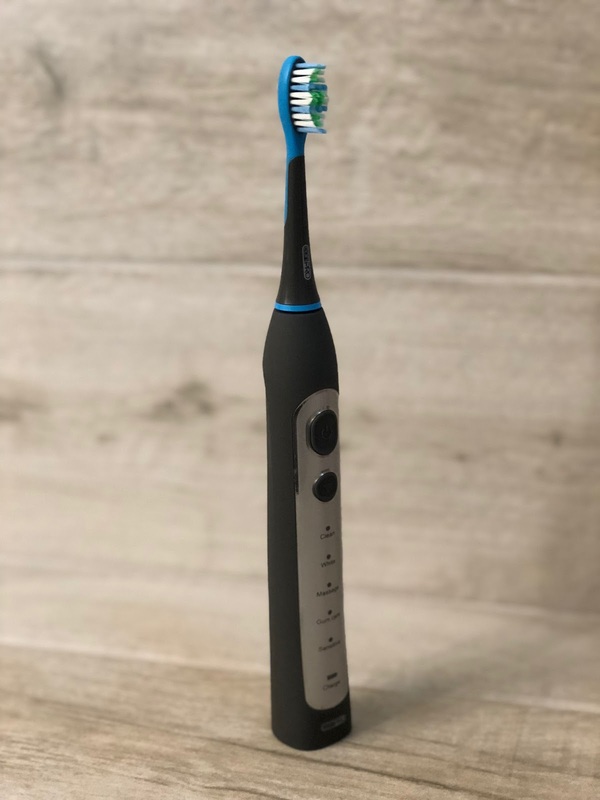 With a sleek design, interchangeable brush heads and long battery life, this toothbrush is a winner. The CariPRO toothbrush has five settings - clean, white, massage, gum care, and sensitive. I'm loving the "sensitive" setting currently, as pregnancy makes your gums more susceptible to become swollen (thanks, hormones). It also has a timer that pauses every 30 seconds to alert you that it's time to move to the next quadrant of your mouth, totaling 2 minutes. I've seen such a difference in my smile in a short period of time, I'm ditching my regular toothbrush for the foreseeable future! I'm so excited to offer my readers a 20% discount and a chance to win a CariPRO Electric Toothbrush!